Once again, we come to an installment of Tabletop Co-Op, where we discuss the world of cooperative board and card games. This time around, we are taking a look at the Pathfinder Adventure Card Game, a co-op deckbuilding RPG hybrid. Go on a quest, fight the bad guys, and find new loot cards to shuffle into your deck for the next session in this unique and innovative card game. 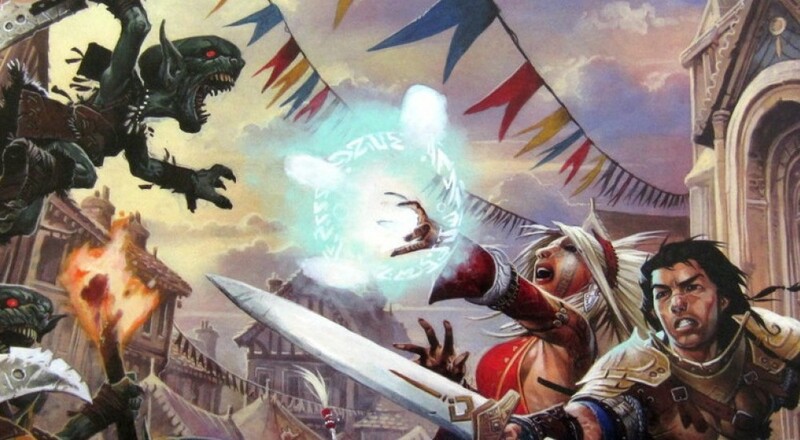 Pathfinder is a fantasy RPG system, developed about a decade ago by Paizo. It is very similar to Dungeons & Dragons, with a ruleset heavily influenced by the third edition version of D&D. In the years since the radical changes of D&D 4th Edition, Pathfinder has become even more popular. The Pathfinder card game is set in the same universe as the RPG, and shares some mechanics with a heavy use of the RPG’s background elements. The Pathfinder Adventure Card Game is, at its heart, a deckbuilding game. However, it is quite distinct from deckbuilders like Dominion and Legendary in that the changes in a player’s deck last from one game to the next. In Dominion, your small stack of starter cards grows quickly during the game. The cycle of purchasing new cards, adding them to your deck, and using them to purchase new cards goes by at a fast pace. At the end of the session, all the cards go back in the box. Most deckbuilding games follow this same basic scheme. The Pathfinder Adventure Card Game changes this scheme up. In traditional RPGs, characters go on adventures, which over time form a campaign. Pathfinder follows this same structure but applies the deckbuilding mechanic. Instead of a character sheet, your character is represented by a deck of cards. When you first create characters, these decks are filled with “starter” cards, just like other deckbuilders. As characters go on adventures, they will find new loot, including spells, blessings, weapons, armor, and even henchmen. These are added to the player’s deck for the next game. Eventually, the starter cards will all be replaced. Over the space of several sessions, characters get more powerful, just as in an RPG. Representing the genre standard of a slow increase in character strength over time by using the deckbuilding mechanic is sheer brilliance and it works quite well in play. “Adventure” is right there in the title, so as you might expect, there is a strong theme and an authentic RPG feel to the game. When you play, it feels very much like a session of classic D&D. You can sit down to play a one shot scenario, or work your way through a series of connected sessions which make up an adventure path. 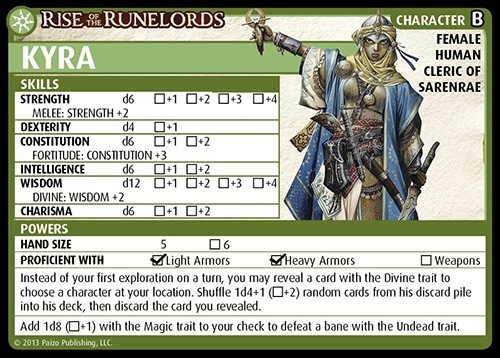 The base set for the Pathfinder Adventure Card Game is subtitled "Rise of the Runelords". This series of adventures is taken straight from the Pathfinder RPG. Players are rewarded by accomplishing goals set forth for the different parts of the adventure. The feeling of continuity is unique to deckbuilding games, and again, feels much like a traditional RPG in this way.